Manchester City steamrolled champions Chelsea with a thunderous three-goal victory at the Etihad Stadium, as Agüero, Kompany and Fernandinho made the Citizens' first display at a new-look home ground more than worth the wait. After being thwarted multiple times by Asmir Begović, Sergio Agüero finally netted after half-an-hour, finding space when set up by Yaya Toure to outwit a bunch of Chelsea defenders. Medics were in demand towards the end of the first half, with both Diego Costa and Gary Cahill sustaining injuries—quite topical judging by the week's recent headlines. Jose Mourinho's men just weren't enough on the day; despite raising the octane in the midst of the second half, a Vincent Kompany bullet header would sink the reigning Champions, before a sublime strike from Fernandinho six minutes later completed an extremely bold statement of intent from the hosts, while absolutely stunning Chelsea in the process. On a beautiful day in Manchester, where fans created a cauldron at the new and improved Etihad Stadium, Chelsea started the action from right to left, but would find themselves in trouble within less than a minute, as Sergio Agüero was put through on goal via a cutting-edge pass from the magical David Silva only to be thwarted by Begović. Embracing possession and keeping their cool, an early way to combat the progressive storm of attack that the hosts were cultivating was under usage from Chelsea. In hindsight, it would hardly calm nerves—with César Azpilicueta dangerously clearing the ball back towards his own goal when his compatriot David Silva almost supplied Agüero with another goalscoring chance. After a few minutes it became clear that the game would be far more open than expected. Raheem Sterling's runs down the left were soon getting the better of Branislav Ivanovic, while David Silva's influence on the game was ever-increasing. Diego Costa—who's game was packed with heated affairs—was furious when Martin Atkinson denied his penalty claim just 7 minutes in. 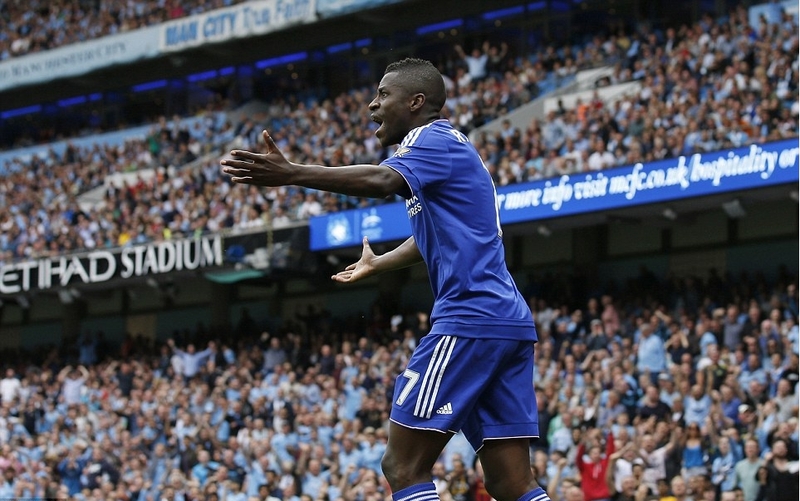 The Chelsea striker went down at the hands of Mangala, but there was little contact to prove in his favour. City's weaponry continued to see no limits, this time the Blues were forced to defend against the dangers of Aleksandar Kolarov—getting closer to providing an assist each time he whipped the ball in from the left wing. Agüero managed to get a boot on his free-kick from deep, but it was an easy save for Begović in the end. The next meeting in the in-game saga between goalkeeper and striker would see the Chelsea man prevail once again, this time initiated by the lovely movement in possession of the Citizens, leading to Kolarov finding the hitman with a low pass. Cahill and Terry stood their ground, forcing the Argentine to steer away and try to find a shot on the turn which was saved. Continuing to knock on the door, opportunities were opening up at all places—with Yaya Toure overcoming two players with sublime skill and strength, while Agüero's chances piled up—this time not being stopped by Begović instead not getting enough contact on the ball to creep it past the keeper off Kolarov's delivery. After a frantic 25 minutes, Chelsea were beginning to put their stamp on the game, changing the tempo and taking the sting out of the opposition as they passed around and waited for an opening. That wouldn't last long, but it did enough to balance the books in terms of both sides' attacking contributions. After an easy clearance for Nemanja Matic from a corner, Willian opened up for a shot at goal after driving through too shooting range. Back on the other side, Yaya Toure couldn't get a clean connection on goal, but that wouldn't matter because seconds later City found the opening. It became somewhat inevitable, but finally Sergio Agüero managed to beat Asmir Begović and steer Manchester City ahead. He played a one-two with Yaya Toure, creating space brilliantly as he weaved through a number of defenders before placing it into the bottom corner. That lead could have been doubled just minutes later. Yet again it was Aleksandar Kolarov whose crosses were proving most threatening, but Mangala couldn't get there before Begović. Someone who was in the way, however, was Gary Cahill—the English centre-half was punched straight in the nose as his keeper came out to stop the danger. Chelsea's medical team would then come into action, helping Cahill who was bloodied up following the collision. 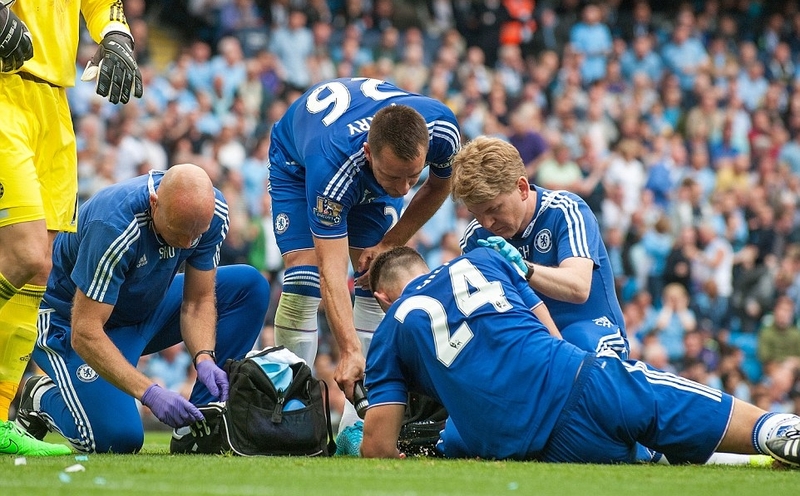 Manchester City's medical team needn't rest, since they'd be required to help a Chelsea player towards the end of the half. As football would have it no other way—they were in the headlines and now at the focus during a match. Fernandinho was booked for a mid-air elbow to Diego Costa and that would anger the Spaniard who sported a head bandage during his angry burst at the end of the first half—one which City went into with the lead. Almost picking up from where they left off, City looked strong to start the second period. 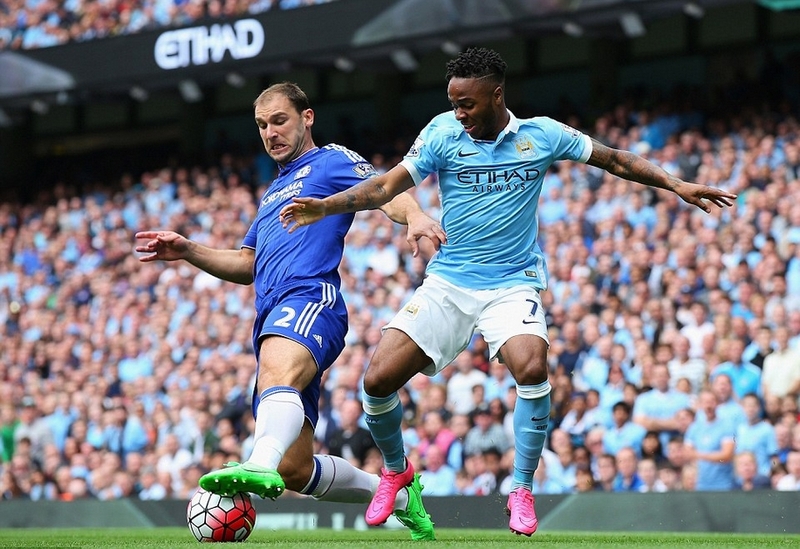 Kolarov's delivery couldn't find Mangala, while Sterling raced past Ivanovic moments later. Chelsea would make sure they were not being gunned down, though, since Ramires would put the ball into the back of the net and celebrate, only to be ajudged offside, and for him to be incredibly out of position when the next wave of attack was queued. Less than ten minutes into the second half and it was a fully-drawn battlezone in competitive respects. 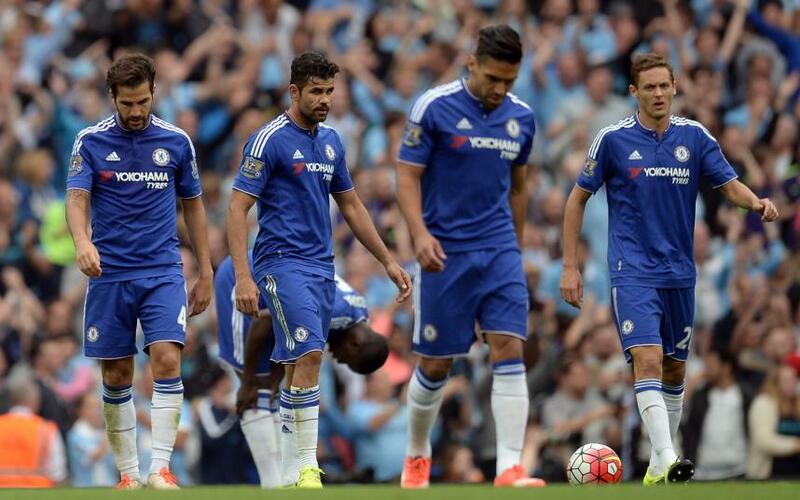 Eden Hazard was beginning to increase in activity, while Manchester City's counters were continuing to unsettle. From what was euphoria was now becoming a collection of nerves. Yaya Toure's shot was collected by Begović before Costa teed up Hazard to burst forward but the PFA Player of the Year would not be able to break through a sea of defenders. The other star of the show, Agüero, would fire wide but it was City who still looked the most threatening with their attacks. 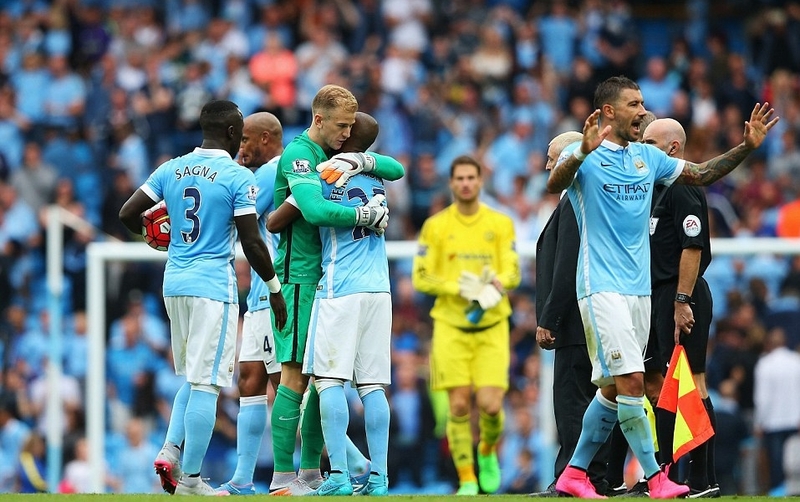 City would soon be breathing a collective sigh of relief when Joe Hart saved them after over-committing. Seeming a little too desperate to kill the game off, Diego Costa and Eden Hazard made their way into the box, with the latter eventually being saved after outdoing defenders. While the home team had the advantage, the game was on a knife-edge once again. After a series of substitutions, Vincent Kompany got his team pretty much over the line with a header almost identical to the one he scored at the Hawthorns just six nights prior. Racing to meet the corner and guide it off the far post, the captain had continued City's rise to really mark an intent for a Premier League title. Lethargic through exhaustion from chasing the game for such a long period, the final goal from Fernandinho all but sealed three points and secured the prompts to shock the world. Another counter attack would just tear through the visitors, lining up for Fernandinho to strike through to the bottom corner and complete it: Manchester City showed the world that they are coming for the Premier League title, even if this was just their second game of the campaign. 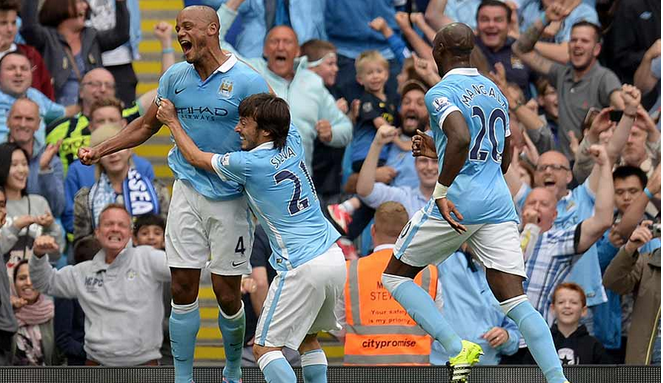 Manchester City dismantle Premier League Champions Chelsea to lay an early mark in the title race.